BMW was not been given approval by the Chinese government to expand a factory which would double production, stoking speculation China is becoming less willing to cater to multinational companies. BMW’s joint venture in Shenyang, BMW Brilliance Automotive, was denied, permission to expand their factory, which would boost production by 400,000 sedans per year. The Chinese Ministry of Environmental Protection rejected the Munich-based company’s plan, citing inadequate waste water analysis and the plant’s failure to meet the government’s anti-pollution targets. The statement also said the joint-venture has failed to pass an inspection on its first phase of the plant. “Drinking polluted water while driving BMW sedans is certainly not the type of industrialization we are looking forward to,” China’s Environment Minister Zhou Shengxian, said in an interview with People’s Daily on Wednesday. A spokesman for BMW said the carmaker had already requested follow up documents and details pertaining to the application’s rejection. Bill Russo, a former Chrysler executive, said it was ‘unusual’ for an expansion project to be nixed. “There’s definitely a pattern here of the government making an example of high-profile foreign companies.” Bill Russo, a Beijing-based automotive consultant told the Financial Times. The rejection sent shares near a four-month low in Hong Kong in Tuesday, and BMW is trading low in Frankfurt, down 1.37 percent at 73.40 euro per share at 10:55 GMT. BMW Brilliance Automotive owns two plants at Tiexi and Dadong, each which have an annual production capacity of 100,000 cars. The German luxury carmaker has experienced great success in the Chinese market, with sales increasing year-on-year 31 percent in May. China has the world’s largest car market. China’s growth slowed to 7.5 percent year-on-year in the first half of 2013, signaling a slowdown to some, and a healthier, robust, and sustainable economy to others. China’s environment ministry has criticised an application by BMW to double capacity at a joint venture factory in the country, citing insufficient investment in environmental protection measures at the facility. While the roadblock may prove temporary, the environment ministry’s willingness to delay a flagship investment project by one of the world’s leading luxury carmakers highlights a growing debate over the real costs of China’s rapid economic growth over the past three decades. “Drinking polluted water while driving BMW sedans is certainly not the type of industrialisation we are looking forward to,” China’s environment minister, Zhou Shengxian, said on Wednesday in an interview with the People’s Daily. China’s growth slowed to 7.6 per cent year-on-year in the first half of 2013, down from 7.8 per cent last year. The Chinese government’s apparent willingness to countenance a slower rate of growth in the world’s second-largest economy has spooked investors and some economists, who fear a knock-on effect. BMW’s joint venture in the northeast industrial centre of Shenyang, BMW Brilliance Automotive, had applied for permission to double production capacity to 400,000 sedans a year, while also expanding an affiliated engine plant. But according to an “opinion” posted on the environment ministry’s website, the joint venture submitted an “insufficient” environmental impact report and failed to meet government pollution reduction targets. It also noted that the planned Rmb9.23bn ($1.5bn) investment included just Rmb70.3m in new money for environmental protection measures. A spokesman for the Munich-based carmaker said the ministry had requested additional documents and details and that the application had not been rejected. “We have no signal that [the investment] will not be approved, but we are confident,” he said. The ministry declined to comment. The environment ministry’s notice, dated July 26, also signals the Chinese government’s increasing willingness to take on well-known multinational companies in the country, accusing them of everything from corruption to inflated pricing and poor customer service. The central government’s most recent target has been UK pharmaceutical group GlaxoSmithKline, accusing some of its employees of involvement in widespread bribery and corruption. BMW Brilliance celebrated the third-phase expansion of the Tiexi plant earlier this month with much fanfare, telling local reporters its production capacity in Shenyang could reach 300,000 units by the end of the year. The joint venture sold 140,000 cars last year. The joint venture’s establishment a decade ago has been widely regarded as a dramatic success story. Demand for BMW sedans soared in a market previously dominated by cheaper models produced by Volkswagen and Audi. In the 10 years since BMW Brilliance was established, China’s car market has grown rapidly to surpass the US as the world’s largest. BMW’s China sales increased 31 per cent year-on-year in May, compared with overall growth of 23 per cent for the industry. Dragon dancers perform near Bayerische Motoren Werke AG (BMW) 3-series automobiles at the opening of the BMW Brilliance Automotive Ltd. Tiexi plant in Tiexi, near Shenyang Liaoning Province, China. 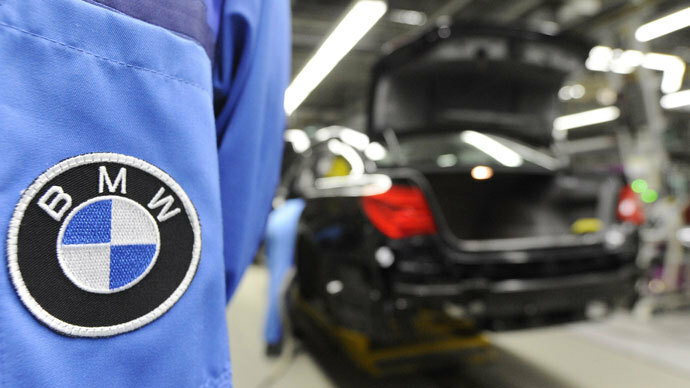 Bayerische Motoren Werke AG (BMW)’s failure to win government approval to expand a factory in China is fueling concern global automakers could find it increasingly difficult to win regulatory approval on projects in the country. Shares of BMW partner Brilliance China Automotive Holdings Ltd. (1114) fell the most in almost four weeks in Hong Kong yesterday after China’s Ministry of Environmental Protection said it sent back an application, citing inadequate wastewater analysis and the plan’s failure to meet government anti-pollution targets. BMW rose 0.7 percent in Frankfurt trading. “The ease of expansion is probably not going to be as easy as in the past,” said Bill Russo, Beijing-based president of automotive consultant Synergistics. Russo, who’s been in China for the past decade, said he can’t recall the government ever issuing a statement knocking back an automaker’s expansion plans for an existing project. Alexander Bilgeri, a spokesman at Munich-based BMW, said the ministry asked for additional documents and that the government decision on the project wasn’t final. Such events are routine, Bilgeri said. Turning down approvals to expand an existing project is “unusual” said Russo, a former Chrysler executive . In the statement, dated July 26 and available on the ministry’s website yesterday, the government said it didn’t approve BMW Brilliance Automotive’s plans for the third phase of a factory in the northeastern Chinese city of Shenyang. The first phase of the plant has yet to pass an inspection, it said. The Economic Information Daily, one of the official Xinhua News Agency’s newspapers, reported July 29 that industry officials are increasingly calling for China to start an investigation into imported car prices. Profit from selling imported luxury cars in China was 30 percent higher than the global average, the newspaper said, citing China Automobile Dealers Association executive vice president and secretary general Shen Jianjun. Getting lower-level bureaus to sign off on manufacturing projects are among the first regulatory steps for foreign companies before they receive central government approval.